Naples and Marco Island have so much to offer in terms of great saltwater fly fishing. Having so much great water to fish from Naples and Marco Island right down the west coast of Florida to Chokoloskee and the Florida Everglades. Whether you are in pursuit of a Giant Tarpon on fly, Sight fishing for Snook and Redfish, or the blistering speed of a Bonita- we’ve got a fishing trip for you. Here is a list of the different species one may encounter while on a charter. Tarpon, Snook, Redfish, Sea Trout, Triple Tail, Jack Crevalle, Spanish Mackerel, Ladyfish, Mangrove Snapper, Sheepshead, Catfish, Pompano, Bonita, King Mackerel, Grouper, Permit, and various types of Shark’s. You have not lived until you have experienced the gill rattling fury of a Giant Tarpon. 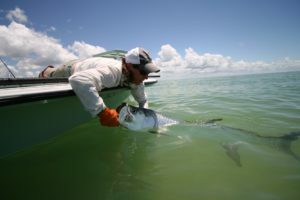 Tarpon inhabit the 10 Thousand Islands from Mid February- Mid November. They can be found cruising in schools, Rolling or laying on the surface in the back water bays and rivers. Tarpon are very sensitive to weather and fishing is best for these great game fish when the weather is hot and calm. I recommend customers fish at least four days to insure there chances of good weather. 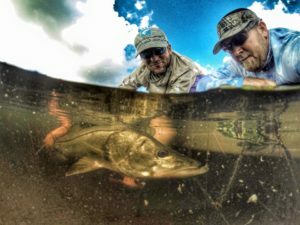 Sight fishing for Snook in the shallow back Country Bays is an experience that any angler can appreciate. Snook ambush there prey and most times lay motionless waiting for a helpless bait to swim by. Snook make a very distinct sound when they smash baits near the surface due to the fact that they inhale there prey. Snook can be caught on many different flies and lures, my personal favorite is the top water fly or surface plug. Night fishing for Snook is very productive and I typically prefer late Fall, Winter, or Early Spring when the bugs aren’t too bad. 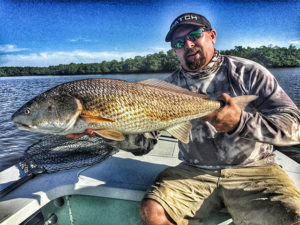 Redfish make up the third fish of our Back Country Slam. When an angler catches a Snook, Redfish and a Tarpon in a day we call it a SLAM. This a great angling achievement and very rewarding for any angler. Red fish can be found tailing, waking, or cruising the Back Bays and flats in search of food. Once hooked the Redfish is a very powerful adversary and fight’s like a bull dog making long surging runs with great speed.